Non-profit F.I.S.H. Inc. will receive KastKing® fishing tackle products to encourage donations and raise program awareness. Garden City, Long Island, NY (September 23, 2015) — During National Breast Cancer Awareness Month in October, along with KastKing®’s Spool it Pink Challenge, KastKing® will be supporting F.I.S.H. Inc. (Friends In Survival and Hope http://www.friendsinsurvivalandhope.com) founded by Capt. Hallie J. Burnett. F.I.S.H. Inc. is a non-profit 501-c-3 organization based in Pensacola, FL dedicated to helping reduce the impact of cancer related problems for the patient and their loved ones. Eposeidon, Inc. based in Garden City, Long Island, NY is the parent company of KastKing®. F.I.S.H. Inc. operates exclusively for charitable purposes. Specifically, this organization has been formed to support other organizations conducting charitable activities, and to provide relief to the poor, distressed and underprivileged battling cancer. During October 2015, anyone who donates $25 or more to F.I.S.H. 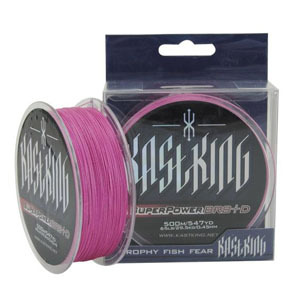 Inc. will receive a complimentary spool of KastKing® Pink Braided Fishing Line. Those donors will be entered in a drawing for additional KastKing® fishing tackle products. Limited quantities of the pink braided line will be available on a first come, first served basis. KastKing®’s Spool it Pink Challenge is about challenging men and women anglers to use pink fishing line as a way to open a discussion with others about the need for early detection for breast cancer. Members of Team Eposeidon, the company’s angler consultant staff, which has male and female members, will ask the fishing public to “Spool it with Pink” by making a donation to F.I.S.H. Inc.. They will encourage them to challenge others to do the same through social media channels. Donations to F.I.S.H. Inc can be made through PayPal or major credits cards on the organization’s website: http://www.friendsinsurvivalandhope.com. Donations to F.I.S.H. Inc. are tax-deductible. “We are thrilled and flattered to have Eposeidon and their KastKing® brand voluntarily step up to the plate to help F.I.S.H. Inc. raise funds and awareness about our program. Every person, every donation, makes a difference. On behalf of all of those who have been affected by cancer, we are extremely grateful,” says Capt. Hallie Burnett. Eposeidon (http://www.eposeidon.com) brings a fresh, innovative approach to anglers by offering quality fishing tackle products at the best prices and no cost, or low cost shipping. Eposeidon’s goal is to exceed expectations through outstanding customer service and superior product value to their customers. Eposeidon is continually expanding its product lines, which include KastKing® fishing line, fishing reels, and fishing rods, MadBite fishing lures, KastKing® Ecooda Pro Series reels, and other fishing tackle products, to meet individual fishing equipment needs. Eposeidon is headquartered in Garden City, NY, USA and sells fishing tackle products globally.